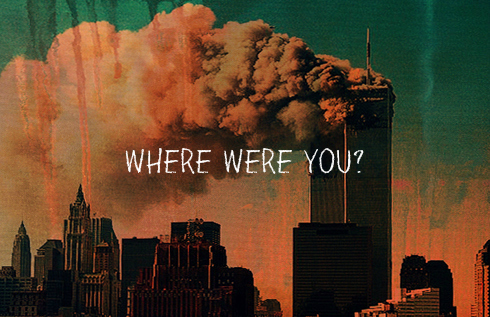 Like most everyone else, I played witness to September 11th on the television and the radio that day in 2001. It might as well have been any other day, but with chaos unfolding over every media outlet and no clear understanding of why it was happening, I think everyone felt paralyzed. I was 17 years old at the time and when my radio alarm went off that morning things were already underway in New York. The tone in the announcers voice was still casual, but it was a big story that a plane had crashed into the WTC. I remember going to the TV as soon as I heard that because I was sure there would be pictures. In my mind I was picturing the tower to look like it did in Independence Day after the attack - I had no idea by the end of the day both towers wouldn't even be there. I ran upstairs where my parents were in the kitchen preparing their breakfasts. I asked them if they'd heard about a plane hitting one of the towers. They hadn't. I clicked on the TV and we watched as a second plane hit. I don't remember getting ready that morning. I remember sitting in front of the TV with my family and throwing a tape into the VCR just before I had to leave to capture things as they were unfolding. Being in high school made the event resonate that much more. Everyone had an opinion, there was lots to discuss, and teachers reminded us that this would be one of those events that we'd remember where we were when it happened. Every classroom was a buzz with theories, stories from family connections, and tempered shock that this was actually happening. I always attribute 9/11 to a major shift in goals, not simply because of the event itself, but because in my own timeline it happened right as I was starting my final year of high school and trying to make plans for college. The event, retrospectively, divided two distinct periods in my life and the dramatic changes taking place at the time. The thing that sticks with me the most from September 11, 2001 is that it was school picture day. All of the class pictures in our yearbook were shot when we were still figuring out what was happening. I just remember a long line of students shuffling through the gym and the gossip becoming more ridiculous. The towers had collapsed by this point and the idea of posing and smiling just seemed so ill-timed. I went to work that evening at Staples. I worked the customer service desk and the store was eerily quiet all night. I remember everyone still wanted to talk about what had happened but we didn't have anything new to say. It was confusing and consuming, and as the weeks rolled on I just remember wanting the conversation to change. My curiosity finally shifted to escape. It was such a bizarre time. It made everyone restless and even a little crazy. I've got yearbook pictures to prove it.